A half-man, half-cyborg hero seeks the source of his mysterious origins while fighting to reclaim the planet from an infernal tyrant hell bent on destroying humanity. Years ago, a brave human soldier perished in the first war against Hell. Decades later he reawakens in a powerful new body of steel. But the forces of darkness have also reawakened, and now the nefarious Count Draculon is determined to snuff out all light in the universe. 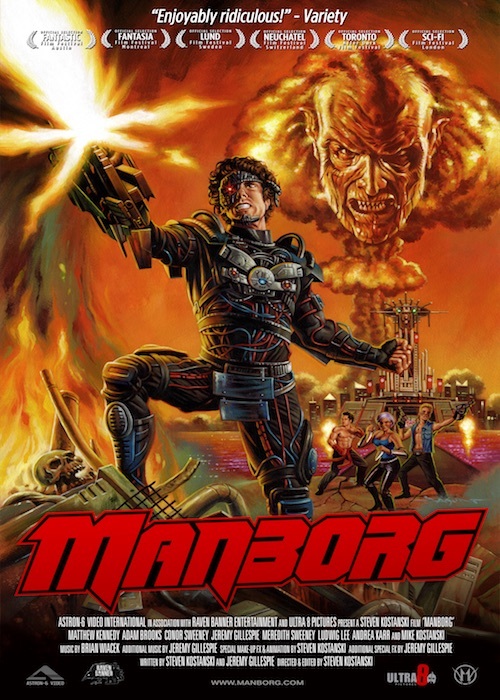 With an Australian renegade, a blade-wielding beauty, and a true martial arts master by his side, however, Manborg prepares to show Count Draculon that the human race isn't about to go down without a fight. Matthew Kennedy and Meredity Sweeney star in this post-apocalyptic action yarn from the folks who brought you Father's Day.